Maruti Suzuki today launched their new model Ignis in India today at a starting price of INR 4.59 lakhs(Ex-showroom Delhi). New Maruti Ignis is derived from i-M4 concept, production version of Maruti Suzuki Ignis was unveiled first at the 2016 Delhi Auto Expo. It was originally showcased at the 2015 Tokyo Motor Show before getting launched in India today at ‘IGNIS ELECTRONATION! None-of-a-kind Car Launch Concert’ where Swedish DJ, Axwell performed live. Ignis is a compact entry-level crossover from Maruti Suzuki and to be retailed through NEXA dealerships which offers premium experience to buyers. The Ignis is the first vehicle from Maruti Suzuki to get e-booking (started already from 1st January) and there are loads of customisation available at exterior and interior. It gets standard dual airbags and ABS, 15-inch alloy wheels, Nexa safety shield, pre-tensioners, force limiter and isofix along with front and rear impact shield. Entering the market on Jan 13th, it will be sold through Nexa and comes with stylish LED projector headlamps (first for Maruti), carbon-fibre detailing, seven-inch touchscreen infotainment with mirror link, Apple CarPlay and Android Auto. Automatic transmission options available in both petrol and diesel engines while Allgrip 4WD system could be introduced later. 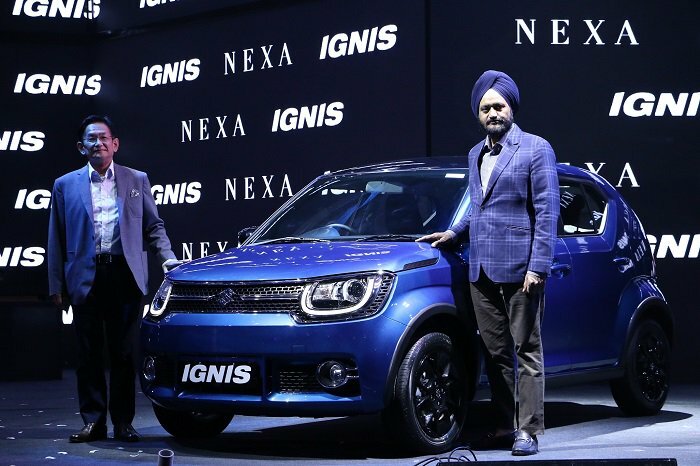 Aiming to attract young generation customers at affordable price range which starts from Rs.4.59 Lakh, the Ignis all set to begin a new trend for more ultra-compact SUVs to come in the near future from other volume-selling manufacturers as well. Here is everything you need to know about the Maruti Suzuki Ignis micro-SUV. The sub-4m Ignis micro-SUV powered by the four-valves-per-head, inline, four-cylinder, DOHC petrol power unit which has a displacement of 1197 cc. The VVT, K-series petrol engine, also found under the engine bay of Swift, is capable of pushing out a maximum power output of 84 bhp at 6,000 rpm and 115 Nm of peak torque at 4,000 rpm and delivers a good ARAI certified mileage of 20.89 Kmpl. The Maruti Suzuki Ignis have 3,700 mm of length, 1,595 mm of height and 1,660 mm of width and it will surely take customers by surprise and parts are being readied for Ignis as we told you in a recent post. Maruti Suzuki Ignis is set to create a new category for itself and should take customers by storm as an entry-level SUV or Micro SUV with the practicality of a hatchback by rivaling against the Mahindra KUV100. Ignis have an ample ground clearance of 180 mm while the kerb weight will be around 900 kg. The bootspace capacity is at 258 litres and can be expanded to 415 litres. As always Maruti Suzuki Ignis will be completely manufactured in India with more than 95% localisation of parts and will have a competitive price tag. Amazingly, the prices is started from Rs. 4.6 Lakh and end at a very competitive Rs. 7.46 Lakh because other products in the same category need not have to face cannibalisation. Maruti’s huge ambitions of entering a new SUV market is finally coming true. Ignis will kick things up for the country’s largest car maker in this segment and the rest will be followed with a premium higher-level SUV. S-Cross is already here to help but it is more of a crossover with soft-roader SUV credentials besides the popular Vitara Brezza.